You won’t often find a book jacket adorned with praise from Ocean Vuong, CA Conrad, and Rusty Morrison. 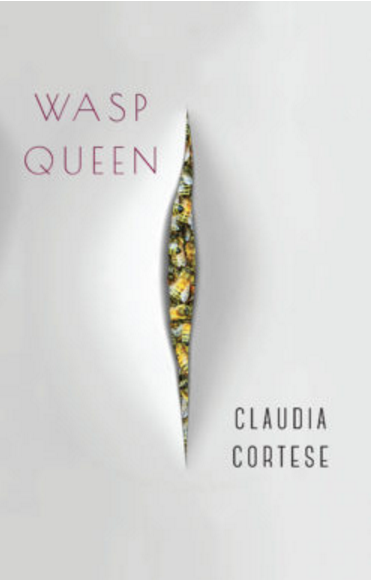 With Claudia Cortese’s Wasp Queen, the praise is well-deserved. Released in 2016 by Black Lawrence Press, Wasp Queen gives readers a portrait of youth, pain, and strength all while presenting surreal and beautiful imagery. Vuong writes, “Wasp Queen possesses something permanent and searing at its core: the will to live, even thrive, despite the shackles of childhood, despite even oneself.” The “shackles of childhood” prove to be harsh and abusive in Cortese’s poetic universe, as well as divisive in terms of how female gender expectations bombard children and teenagers. Morrison writes, “Cortese graphically exposes and explores what it would mean if a young girl, brutalized by all that is considered allowable by the social norms of our debased culture, could actually speak her mind.” What Morrison is engaging with here is that Cortese’s universe is driven by a young girl named Lucy, and Lucy is vibrant and honest and strong. We see Lucy in every aspect of her childhood, and we are reminded of the pain so many face from parental abuse to childhood bullying. The patriarchy is unrelenting in its bombardment against Lucy, and with all of the pressures society forces onto her from weight to beauty to Polly Pocket to sexuality, Lucy shows the reader that this poetic universe stings without remorse. Back home, Lucy decks the tree in Barbie heads, watches the snow cut the landscape, all those little white knives. She leaves a hill of Jujubes where her mother’s ant traps should be. Lucy demands Santa stitch her a skin of bees, that her screams be not sound but solid: a stinger that stings and stings. Lucy is a teenager and yet very youthful—as if she has hopes to preserve her pre-teen years and the concept of youthful innocence and even ignorance. Her actions and revelations give the reader the sense that she wants to transgress and yet struggles with her peers’ perceptions of her. Lucy scrapes the sandbox, writes tangerine and starblade and dead girls glow prettiest. She cuts a caterpillar. Throws one green half in the grass. Puts the other in her mouth. The more we learn about Lucy, the more we begin to question our own notions and concepts of gender and gender construction. It would be naïve, though, to think of ourselves as just human since gender is thrust upon us—and the ramifications of gender are very real and for some, very brutal. Lucy feels a worm sour her belly, its wiry acids churn to her throat. The burn cools when she smacks Milo in the head. It cools when she tells Stephanie the story of two bunnies that the starving family ate without skinning or frying, their mouths furred in red pulp. The recurring image of the swallowed worm shows up again, and the worm seems to cause Lucy pain—pain that can only be calmed with violence. Cortese’s meticulous portrayal of Lucy and her relationship with violence impacts the reader poem to poem, and as the collection moves forward beyond “Origin story,” we finish with another keystone poem titled, “Answer key for origin story.” The poem’s key moment occurs in the final multiple choice answer: “Do you want a girl for your private hurt—her actions your own. Is Lucy your daughter. Is she you.” While gender may impact a reader’s understanding of the end of this poem, the sentiment is stark and pensive—and the abuse is real and painful. I can’t remember eating bugs when I was a young boy, but I understand Lucy. Somewhere along the path to adulthood gender roles were forced upon us, like the time I was discouraged to watch The Little Mermaid or the time Lucy was told she had to look a certain way. Cortese’s Wasp Queen confesses a story that readers, regardless of their gender identities, should read and digest—this way we can learn how to be queens instead of drones.